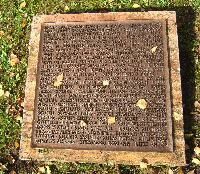 The sections of the city cemetery in Tuebingen are lettered according to the alphabet. 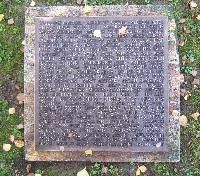 The part shown here, "Graeberfeld X" or "Cemetery X" served as the cemetery for the anatomical institute of the university from 1849 to 1963. People who had donated their bodies to science were buried here. 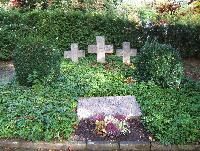 But the 1077 people who were buried here from 1933 to 1945 died as victims of the Nazi regime: starved or killed in POW camps, in hospitals, in concentration camps, work camps, etc. More than 70 were hanged or beheaded by military courts for resistance or openly doubting military victory in the war. 44 of the people here were murdered by the German secret police without trial. 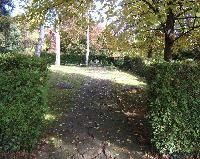 156 were POWs or forced laborers who died of various diseases or of exposure and exhaustion in their camps and were buried here after use by the anatomical institute. These pictures were taken on October 22, 2005. My background information is from the sign at the site itself. 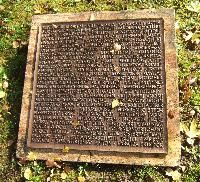 More detailed information is available in German in: Schoenhagen, Benigna: Das Graeberfeld X. Eine Dokumentation ueber NS-Opfer auf dem Tuebinger Stadtfriedhof. Tuebingen, 1987. The entryway with a sign explaining the history of the site, in German. The sign points out explicitely how the site changed over time as successive generations added more and more to the memorial. There are six plaques listing the names of the victims, three on each side of the small pathway. These plaques were added only in 1980. They list 517 of the victims. 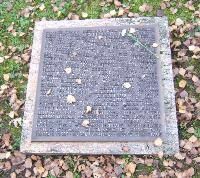 Another of the six plaques. These three crosses were the first indication of a memorial at this site. They were added in 1952. It is hardly visible on the photo, but they read, "1939-1945", giving the impression that it is a war memorial. The stone slab in front of the crosses was added in 1963. It reads, "Here rest several hundred people of different nationalities who met violent deaths in the camps and institutions (Anstalten) of our countries". This photo was taken on 9 November, 2005. Someone with a bit of artistic sense has layed a small bundle of flowers over the stone. The same had also put a flower over one of the name plates. This plaque, to the right of the crosses and the stone slab, was added by the university in 1990. The intent to finally "get it right" and be explicite and clear about what happened is obvious: "Having been hauled off, oppressed and mistreated / victims of arbitrariness or blinded jurisprudence / people found rest only here / (and) from their bodies a science which does not respect the rights and dignity of man demanded use / May this stone be a warning to the living". 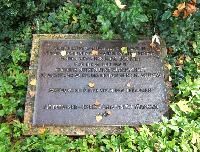 This plaque was defaced a week after it was put up, and swastikas painted on the stone slab and the bronze plaques. 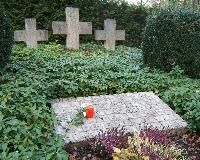 Only a week before the 1990 stone was put in were the last body parts and samples dating from the Nazi period taken out of the university and buried here. Until that time, 45 years after the end of the war, these traces of people who had not given their consent to being used for medical purposes were still being used by the anatomical institute. 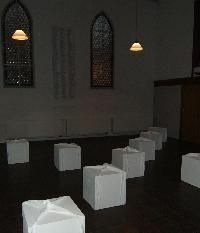 This is an installation by Ilona Lenk, displayed in the chapel of the cemetery from 2 to 20 November, 2005. The 13 blocks represent the 13 unknown victims buried in the nearby section X of the cemetery.